The Oatmeal's Matt Inman Tests Out His Tesla Cannon on Matt Harding of Where the Hell is Matt? The Oatmeal’s Matt Inman Tests Out His Tesla Cannon on Matt Harding of Where the Hell is Matt? 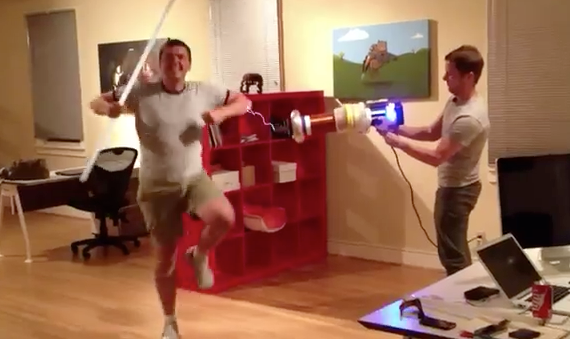 Where the Hell is Matt takes 10,000 volts for science! Watch in this video as Matt Inman of The Oatmeal tests out his new Tesla Cannon on Matt Harding of Where the Hell is Matt?. The long light bulb that Harding is holding (while dancing, of course) lights up as he’s being zapped by Inman.